The School Board Workshop scheduled for November 15, 2018 has been cancelled. The Finance Committee scheduled for November 20, 2018 has been cancelled. Policy Committee Meeting for tonight, November 1, 2018 has been cancelled. Minutes for the Policy Committee Meeting held on September 6, 2018. Please click on link for minuthttp://5il.co/4xjkes. Reminder - May 2, May 9, and May 16 the end of the school day will be extended by 1 hour. High and Middle Schools dismiss at 3 pm. Elementary Schools dismiss at 4 pm. The Drop Out Prevention Committee Meeting scheduled for today has been cancelled. Due to today's storm the Late Start Committee Meeting scheduled for this afternoon has been cancelled. Due to the icy road conditions, there will be no school in MSAD 11 - Wednesday, March 14. MSAD11 schools will release early on Friday, February 16th for teacher workshops. GAHS & GRMS release around 11:30 am, grades K-5 release around 12:30 pm. There will be a 2 hour delay this morning, Thursday, February 8 in MSAD 11 and no am Pre-K. It is still a bit slick out there this morning. Please drive safe. There will be a 2 hour delay in MSAD 11 this morning, Monday, February 5, 2018. It is icy out there. Drive safe. The MSAD 11 Central Office will be closed all day, Tuesday, January 23, 2018. The School Board has scheduled a Public Forum to discuss the future of TC Hamlin School for Thursday, January 25, 2018 at 6:00 p.m. at the TC Hamlin School. No School in MSAD 11 on Wednesday, January 17, 2017. Stay safe. The Scholarship Reception at Gardiner Area High School scheduled for Thursday, January 4, 2018 has been postponed until Wednesday, May 16, 2018. Due to the pending storm, The Policy Committee meeting scheduled for January 4, 2018 has been postponed until January 11, 2018. Due to the pending storm, the Regular School Board meeting scheduled for January 4, 2018 has been postponed until January 11, 2018. The Finance Committee Meeting scheduled for December 19, 2017 has been cancelled. The Future of TC Hamlin meeting scheduled for tonight has been rescheduled for January 8, 2018 at 6:00 p.m. There will be no Curriculum Committee meeting this morning due to achool cancellation for bad weather. The next Future of Teresa C. Hamlin meeting will be held on November 27, 2017 from 6:00 - 8:00 p.m. at the Teresa C. Hamlin School. The Superintendent's Office - Holiday Office Hours: November 22, 2017 Closing at Noon. November 23 & 24, 2017 CLOSED. The Finance Committee Meeting scheduled for November 21, 2017 has been cancelled. 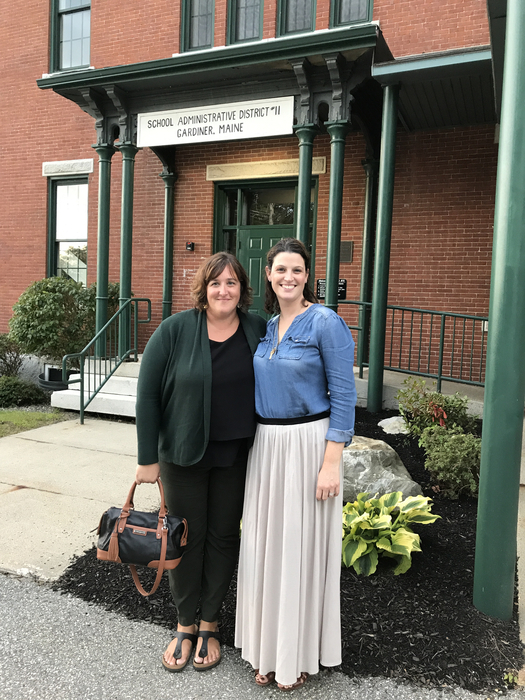 The Future of Teresa C. Hamlin meeting scheduled for October 30, 2017 has been re-scheduled for November 6, 2017 from 6:00 - 8:00 p.m. at the Teresa C. Hamlin School. MSAD 11 - The Early Release Day scheduled for this Friday has been cancelled. Friday will now be a FULL day of school for all students. Pre-Kindergarten students will be in session and will follow their regular Monday - Thursday schedule. Also, all schools in MSAD 11 will be in session tomorrow, Thursday, November 2. Due to the widespread power outages, the Policy and Regular Board Meetings scheduled for November 2, 2017 has been re-scheduled for Thursday, November 9, 2017. The Policy Meeting will be held at 6:00 p.m. and the Regular School Board meeting will be held at 7:00 p.m.
Laura E. Richards School, River View School, and the Central Office are closed. All other schools are open and in session. LER staff should report to LER to collect work and then go to TCH to work. River View staff should report to River View to collect work and then go to the middle school. Laura E. Richards School, River View School, and the Central Office are closed. All other schools are open and in session. Laura E. Richards School, River View School, and the Central Office is closed. All other schools are open and in session. The Gardiner Area Middle School will be open today from 10 am - 4 pm for any staff member wishing to have a shower, charge your phone, or to have a warm place to spend the afternoon. The Gardiner Area Middle School will be open today from 10 am - 4 pm for any community member wishing to have a shower, charge your phone, or to have a warm place to spend the afternoon. There will be no school in MSAD 11 on Tuesday, October 31 due to power outages at 5 of the 7 schools and the central office. Also many roads remain impassable. Stay safe. Tonight’s meeting to discuss the future of the TC Hamlin School has been postponed. A future date for the meeting has yet to be determined. All MSAD 11 schools closed today, Monday, October 30, 2017 due to the storm. 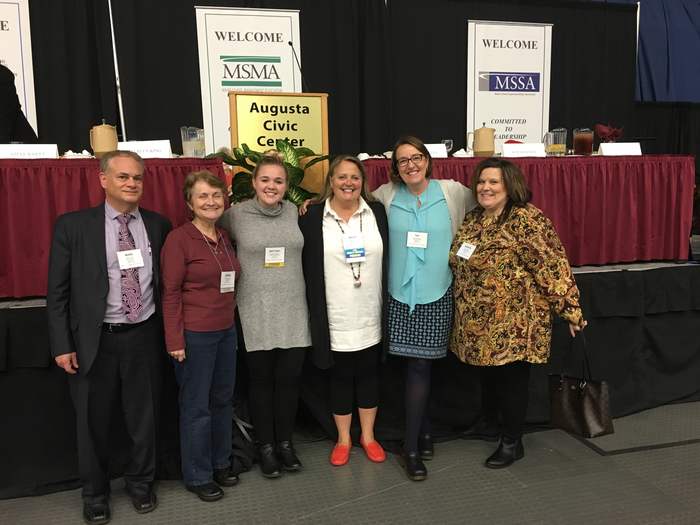 Another informative and educational Maine School Board Conference attended by MSAD 11 School Board members, students, and administration. 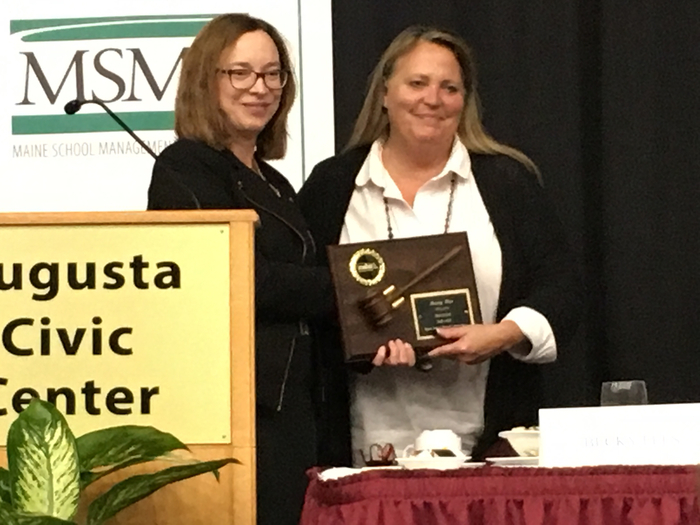 Congratulations to Becky Fles for being recognized by the State of Maine School Board Association for her two year service as President. MSAD11 has an early release day tomorrow for parent/ teacher conferences. No afternoon Pre-K. GAHS and GRMS release around 11:30 am. Grades K-5 release around 12:30 pm. Join us tonight for the School Board meeting at 7.
over 1 year ago, GAHS Technology Dept.